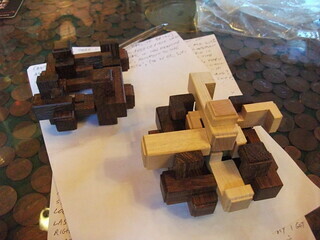 To give you some background, I’ve had this unidentified puzzle, in pieces, for some years. I found the 12 pieces in a bag, photographed them and sent them to Sue and Brian Young at Mr. Puzzle. To cut a long story short, they identified them as part of The Collective, a 24-piece burr surrounding a 5-piece burr. Sue actually wrote, “The mystery is solved. What you have there is 12/29ths of The Collective. But if you can make a 12 piece burr out of it let us know because it could be a good puzzle.” She said the same for another 17 pieces in a second bag... Quite why I had stored them like this, who knows? So last week I took all 29 to the pub. 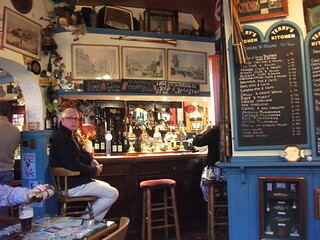 They don’t get out much these days..
That’s the pub, by the way, on the right. So there I was halfway through my third pint of Shepherd Neame Late Red, a tawny Autumn ale, 4.5 per cent. I've got the top half over to one side, carefully assembled during the first pint. The table is stable so it's still intact. In front is the bottom half, with the white burr inside. Then Sue uses words like "Pick up the top half." Which one's that? “Flip it upside down.” Yeah if you're in Queensland. “Turn it 45 degrees.” In which plane? “Lower it down.” Well, down is relative isn't it? What does an Antipodean know about over, behind, or across? By now I'm attracting a small crowd, but nobody seems keen to refill my beer, and I can't leave these tops and bottoms on the table. The instructions didn't print too well, my old black-and-white printer, a dying ink cartridge, failing eyesight, a beer (I think) stain in in the crucial bottom right corner - that's relatively bottom, and relatively right, if course. 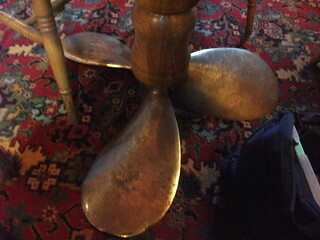 Now we realign the so-called top half on a glass-topped propeller-based table (see right) on loose floorboards, with spectators... I'm very much in need of my 4th pint. Putting the White five-piece in added stability, but this so-called top is too loose to handle. It's like dancing with a ballerina in a strapless, sideless, ballgown with an irate husband looking on, just where do you put your hands? The last attempt, with left pinkie on piece four, left thumb on piece six, a loose right grip on pieces 1, 5, 9, 11 and 12 ended in tears and an unseemly tangle with the loose dog while retrieving (wrong sort of dog) piece eight from the floor to the side of the fruit machine. Actually the French Fry I picked up at the same time has the distinctive Mr Puzzle chamfering (is that what you call it Brian?) and notching as piece nine, but the actual puzzle piece lacks the deep fried finish of the French Fry. Anyway in the meantime I acquired a pint of Tribute Ale, according to the glass, the South West's favourite, although to to an Australian in Queensland the South West is 3,000 miles away. Anyway, we’re back on, following a visit to the gents and a photo-shoot with this article as a backdrop just to keep a record of what it might look like. So, which way is up, what is top, and was that rotation 45 degrees or radians, in X, Y or Z plane? I feel as if I am lining up for the crucial moment like Tommy Cooper about to send four eggs into four glasses (two or three will do). So I've enjoyed three or is it four pints, some supposedly witty banter from the Wednesday afternoon crowd, and the pleasure of assembling some wood that looks like flat-pack self-assembly doll's house furniture? Another visit to the gents. At least with Tommy Cooper's egg trick, the goal is obvious, and as Meatloaf never said, “Two out of four ain't bad”. The bottom half with the white burr is fairly rigid and survived the photo-shoot. The rickety assembly Sue Young optimistically calls the top is looking as skewed as a Mexican cantina after John Wayne has done a few out-takes from “Gunfight at the Sierra Madre”. 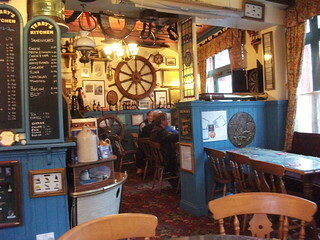 That’s more of the pub, where I do most of my puzzling --->. How can 12 notched pieces be so unstable? Pause for a Mexican joke about “bonus notches”. If the top and bottom were stable it wouldn't be a puzzle, as Alice would say to me. I just noticed the added pressure of being due home in less than an hour. A mobile phone rings anxiously at the next table shaking my concentration. Which is piece four? Slightly jarring one piece destabilises the top half. Use two beer mats, one flat on top and one below to turn the puzzle over. 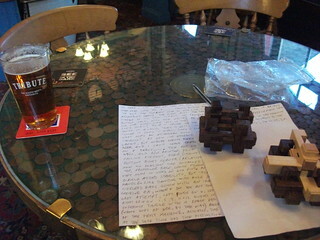 This fails badly, the top is now very unstable, and I am now writing these notes on the back of the instruction sheet with the crumbling puzzle (the top half) preventing me turning them over. Disentanglement puzzlers, secret-opening-box lovers and sliding-piece puzzles are sissies compared to this. The Collective Burr Puzzle lives to fight back another day.!!!! !